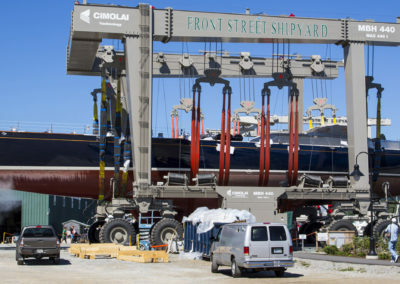 Most sailing fanatics followed the construction and launch of the superyacht SCHEHEREZADE in 2003 by Hodgdon Yachts. At the time she was the largest cold-molded yacht ever built at 154 feet. 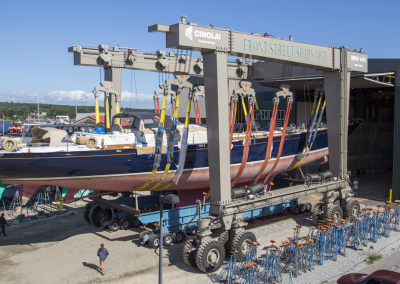 A Bruce King-designed ketch with complex systems and spars that reach the clouds, SCHEHEREZADE still sails globally today under the new name S/Y ASOLARE. Having celebrated her 10-year birthday, ASOLARE was due for her Lloyd’s survey, some fresh paint and systems maintenance. 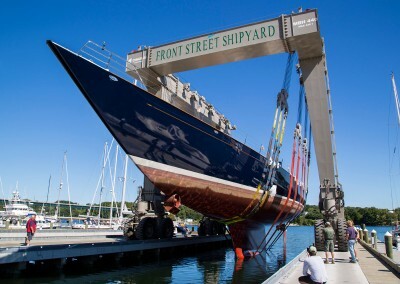 She spent the fall of 2014 with us in Belfast, Maine, for this minor refit. ASOLARE was a fun challenge from the beginning: with a 155-foot-long shop, we only had half a foot of clearance on either side of her when we moved her inside. Our good friends at Brownell Systems built a special trailer to slide her into and out of the shop with relative ease. Once inside, she was turned over to our talented team of composite, systems and metalwork professionals. Kudos to our exceptional paint team who had arguably the most daunting task. 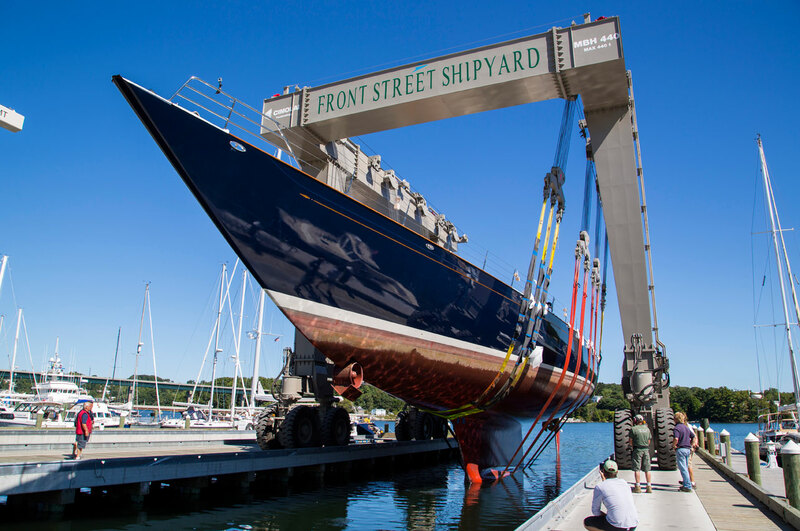 They worked closely with our systems team and the yacht’s crew to sand, fair and paint all 48 meters of the boat, giving her a rich color and beautiful new shine. ASOLARE’s systems are comprehensive, which meant we had to put all of our best technicians aboard. Working with the yacht’s crew, our team identified several updates that would put ASOLARE back in the water with more comfort for the crew and her guests. Our electrical team ran a significant amount of new wire through the hull and mast for computer, electronics and entertainment systems. Some of ASOLARE’s hydraulics also needed maintenance, so we made upgrades to the most critical systems on board the boat. By the time ASOLARE was ready to leave Maine, snow had started to fly. She left the docks in Belfast at the end of December 2014 and has made it to warmer weather since then.